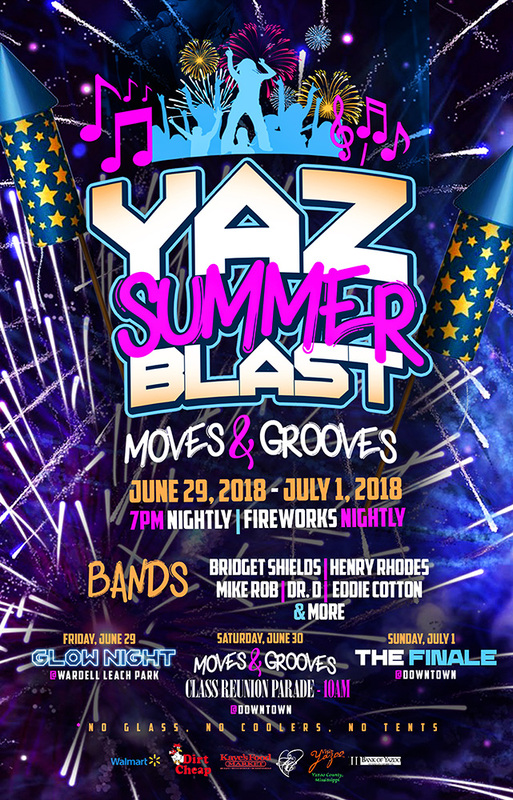 Yaz Summer Blast presented by the City of Yazoo City July 4 – July 6, 2019 Free Admission • No Glass • No Coolers • No Tents Yaz Summer Blast July 4th Celebration 7 PM Nightly • Fireworks Nightly SAVE THE DATE! Past events have brought visitors from all over the country, including visitors from Jackson, MS; Oxford, MS; Chicago, IL; Washington, DC; Dallas, TX; Miami, FL; Los Angeles, CA; Houston, TX to name a few. The Yaz Summer Blast is fast becoming the place to be during the fourth of July in Mississippi. Come show off your “Moves and Grooves” with us. The celebration awaits you!